The ART OF MARK LONE...: name this character! give you a hint... his first film apearance was in 1977. 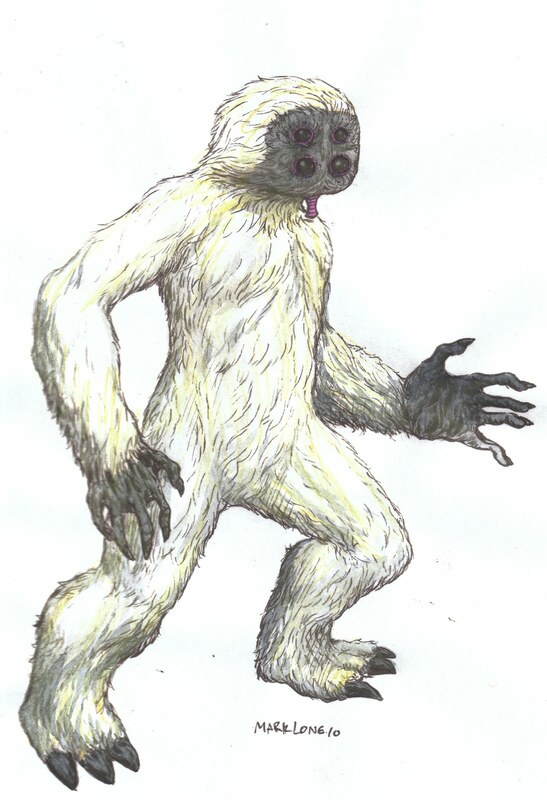 A booth-dwelling cantina patron present when Luke Skywalker first met Han Solo, this particular alien was characterized by a white shaggy coat and four shiny black eyes. He had a warbling pattern of speech, and drank through a short insect-like proboscis. For years, Muftak had no knowledge of his heritage. Muftak's cocoon was accidentally loaded onto an Imperial freighter and deposited on Tatooine. He knew he was different and he never encountered a fellow Talz in his years growing up on the desert world. Muftak grew up in the streets of Mos Eisley, becoming a friend to the regulars at Chalmun's cantina. His hulking size and incredible strength kept him alive in the often-violent port city, and his friendly disposition earned him many allies. Muftak lived in the abandoned tunnels beneath Docking Bay 83 with fellow street urchin Kabe. Kabe became a ward of sorts to Muftak, as he felt compelled to watch over the little Chadra-Fan girl. Kabe also provided them with income, as her talents with thievery provided much-needed credits. Muftak helped Kabe in her bold plan to rob Jabba the Hutt's Mos Eisley townhouse. That in turn led to doing a bit of espionage work for the Rebel Alliance, before Muftak and Kabe took off for Alzoc III to explore his past. The two ventured to different worlds and experienced a number of adventures. Muftak, who was often regarded as simple on Tatooine, developed eloquence enough to tell his story in an autobiographical novel entitled Sands in the Winter. Muftak was known simply as "Four Eyes" during production. He was played by mold maker Laine Liska in the film.